Plasma membrane calcium-transporting ATPase 4 is an enzyme that in humans is encoded by the ATP2B4 gene. The protein encoded by this gene belongs to the family of P-type primary ion transport ATPases characterized by the formation of an aspartyl phosphate intermediate during the reaction cycle. These enzymes remove bivalent calcium ions from eukaryotic cells against very large concentration gradients and play a critical role in intracellular calcium homeostasis. The mammalian plasma membrane calcium ATPase isoforms are encoded by at least four separate genes and the diversity of these enzymes is further increased by alternative splicing of transcripts. The expression of different isoforms and splice variants is regulated in a developmental, tissue- and cell type-specific manner, suggesting that these pumps are functionally adapted to the physiological needs of particular cells and tissues. 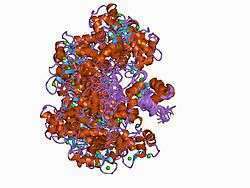 This gene encodes the plasma membrane calcium ATPase isoform 4. Alternatively spliced transcript variants encoding different isoforms have been identified. ATP2B4 has been shown to interact with CASK. ↑ "Diseases that are genetically associated with ATP2B4 view/edit references on wikidata". ↑ Olson S, Wang MG, Carafoli E, Strehler EE, McBride OW (Jul 1991). "Localization of two genes encoding plasma membrane Ca2(+)-transporting ATPases to human chromosomes 1q25-32 and 12q21-23". Genomics. 9 (4): 629–41. doi:10.1016/0888-7543(91)90356-J. PMID 1674727. 1 2 "Entrez Gene: ATP2B4 ATPase, Ca++ transporting, plasma membrane 4". ↑ Schuh, Kai; Uldrijan Stjepan; Gambaryan Stepan; Roethlein Nicola; Neyses Ludwig (Mar 2003). "Interaction of the plasma membrane Ca2+ pump 4b/CI with the Ca2+/calmodulin-dependent membrane-associated kinase CASK". J. Biol. Chem. United States. 278 (11): 9778–83. doi:10.1074/jbc.M212507200. ISSN 0021-9258. PMID 12511555. Heim R, Hug M, Iwata T, et al. (1992). "Microdiversity of human-plasma-membrane calcium-pump isoform 2 generated by alternative RNA splicing in the N-terminal coding region". Eur. J. Biochem. 205 (1): 333–40. doi:10.1111/j.1432-1033.1992.tb16784.x. PMID 1313367. Strehler EE, James P, Fischer R, et al. (1990). "Peptide sequence analysis and molecular cloning reveal two calcium pump isoforms in the human erythrocyte membrane". J. Biol. Chem. 265 (5): 2835–42. PMID 2137451. James P, Maeda M, Fischer R, et al. (1988). "Identification and primary structure of a calmodulin binding domain of the Ca2+ pump of human erythrocytes". J. Biol. Chem. 263 (6): 2905–10. PMID 2963820. Brandt P, Zurini M, Neve RL, et al. (1988). "A C-terminal, calmodulin-like regulatory domain from the plasma membrane Ca2+-pumping ATPase". Proc. Natl. Acad. Sci. U.S.A. 85 (9): 2914–8. doi:10.1073/pnas.85.9.2914. PMC 280113 . PMID 2966397. Howard A, Barley NF, Legon S, Walters JR (1994). "Plasma-membrane calcium-pump isoforms in human and rat liver". Biochem. J. 303 (Pt 1): 275–9. doi:10.1042/bj3030275. PMC 1137587 . PMID 7945253. Váradi A, Molnár E, Ashcroft SJ (1996). "A unique combination of plasma membrane Ca2+-ATPase isoforms is expressed in islets of Langerhans and pancreatic beta-cell lines". Biochem. J. 314 (Pt 2): 663–9. doi:10.1042/bj3140663. PMC 1217098 . PMID 8670083. Santiago-García J, Mas-Oliva J, Saavedra D, Zarain-Herzberg A (1996). "Analysis of mRNA expression and cloning of a novel plasma membrane Ca2+-ATPase splice variant in human heart". Mol. Cell. Biochem. 155 (2): 173–82. doi:10.1007/BF00229314. PMID 8700162. Zacharias DA, DeMarco SJ, Strehler EE (1997). "mRNA expression of the four isoforms of the human plasma membrane Ca2+-ATPase in the human hippocampus". Brain Res. Mol. Brain Res. 45 (1): 173–6. doi:10.1016/S0169-328X(97)00009-0. PMID 9105688. Dean WL, Chen D, Brandt PC, Vanaman TC (1997). "Regulation of platelet plasma membrane Ca2+-ATPase by cAMP-dependent and tyrosine phosphorylation". J. Biol. Chem. 272 (24): 15113–9. doi:10.1074/jbc.272.24.15113. PMID 9182531. Kim E, DeMarco SJ, Marfatia SM, et al. (1998). "Plasma membrane Ca2+ ATPase isoform 4b binds to membrane-associated guanylate kinase (MAGUK) proteins via their PDZ (PSD-95/Dlg/ZO-1) domains". J. Biol. Chem. 273 (3): 1591–5. doi:10.1074/jbc.273.3.1591. PMID 9430700. Guerini D, García-Martin E, Gerber A, et al. (1999). "The expression of plasma membrane Ca2+ pump isoforms in cerebellar granule neurons is modulated by Ca2+". J. Biol. Chem. 274 (3): 1667–76. doi:10.1074/jbc.274.3.1667. PMID 9880546. Rosado JA, Sage SO (2000). "Regulation of plasma membrane Ca2+-ATPase by small GTPases and phosphoinositides in human platelets". J. Biol. Chem. 275 (26): 19529–35. doi:10.1074/jbc.M001319200. PMID 10748016.